← Call the Governor to Expand Medicaid – we need his plan! Thrilled that Congresswoman Alma Adams to keynote NC NOW state conference! Big News! 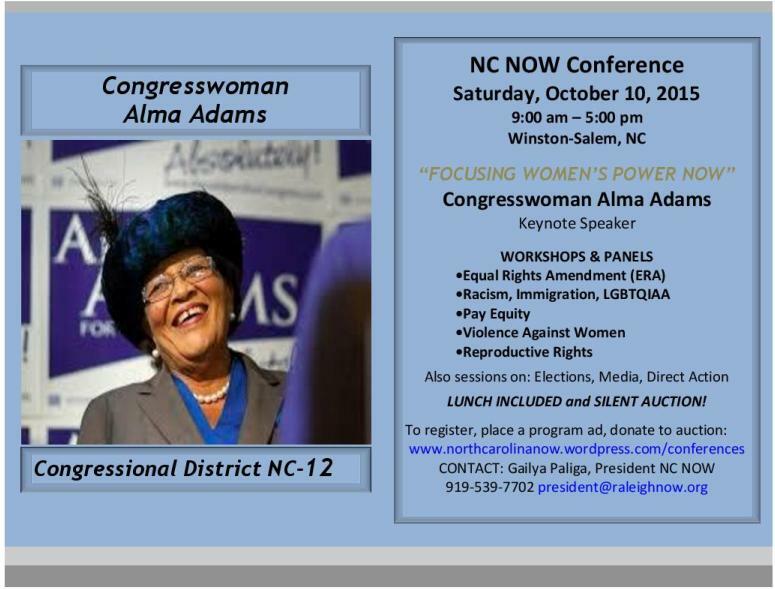 Congresswoman Alma Adams is the keynote speaker for the 2015 NC NOW State Conference, theme “Focusing Women’s Power NOW!” Save the date – Oct 10, 2015, and join us in Winston-Salem, NC. This entry was posted in domestic violence, economic justice, Equal Rights Amendment, ERA, lgbt, racism, reproductive rights, Uncategorized, women and tagged Equal Rights Amendment, racial justice, violence against women, women, women's rights. Bookmark the permalink.